To the naked eye, all sand looks pretty much the same. But magnified by a hundred-fold or more, each individual grain exhibits a distinct beauty. Dr. Gary Greenberg photographs what he calls these "dramatic landscapes of hidden worlds" using a high-powered light microscope to give each grain its due. "The reason I focus on sand is to show people how ordinary things are truly extraordinary when you look from a new point of view," Greenberg told the Huffington Post. 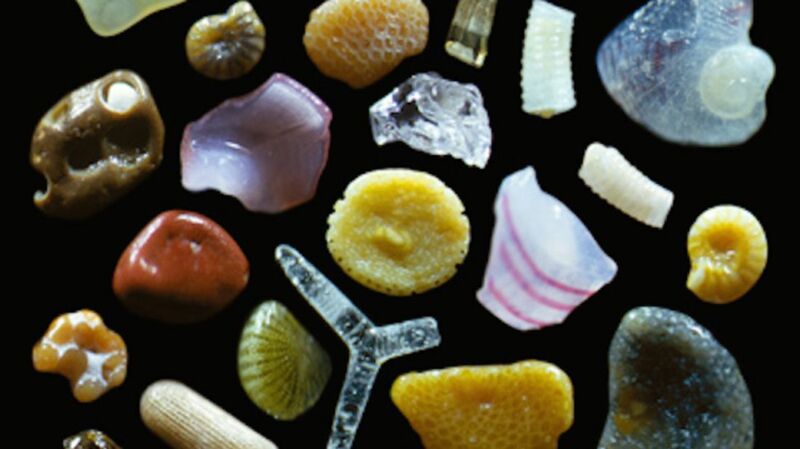 These tiny sand-sized shells are magnified 300 times. The orange coloration on this grain from a beach in Costa Rica comes from chabazite, a glassy cubic mineral. At 150 times its original size, this Japanese sand looks like a crystal. The transparent Y in the middle of this pile of sand from Maui, Hawaii is part of the silca sponge spicules that form the internal skeleton of sea sponges. This vivid volcanic sand is also from Maui. The opalescent spiral was once the tip of a shell that was worn down into a tiny grain by the relentless surf. This star is actually the skeletal shell of a single-celled foraminifera found in Okinawa, Japan. If you want more of these mini masterpieces, Greenberg has a whole book of sand photos as well as series featuring other microphotographic wonders. All photos courtesy of Dr. Gary Greenberg.